itylish is an Etsy shop which intrigued me due to the interesting use of the papier-mâché technique which I honestly have not used or seen in years! 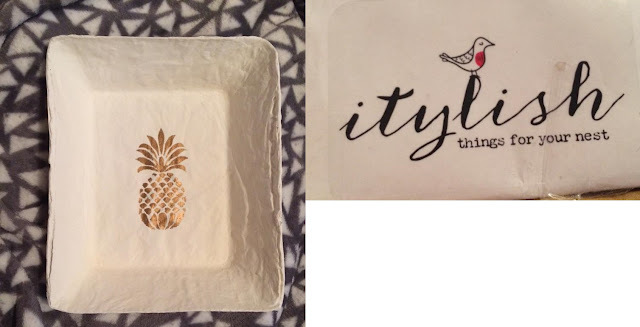 I'm in love with pineapple homeware items at the moment and itylish has some lovely pineapple themed goodies! There's also lots of cute lampshades on offer which are made from repurposed frames. My lovely pineapple coin tray has been made from old newspaper as well which is pretty awesome really as it's such an eco-friendly way of crafting! Here's my gorgeous tray! It is painted in Annie Sloane paint and the pineapple is done in gold leaf paint mixed with a little sand for texture. The tray is so much bigger than I imagined so it's really good value. It's really gorgeous, I'm in love with how pretty the papier-mâché looks. As for the packaging, it was super professinal! It was secured with these clear itylish stickers and it literally could have been from a large established homeware company! I was taken aback by just how professionally my order was packaged. Definitely check out itylish for cute lampshades and papier-mâché cuteness.